This chocolate mousse is beautifully light and incredibly easy to make. You can make them just before you sit down to eat and leave them to cool slightly in the fridge before serving them for pudding. By whisking both the egg yolks and the egg whites it helps the mousse become smooth and airy. When you cut into the mousse you should be able to see a mass of bubbles not dissimilar to an Aero chocolate bar. The mousse is made using Cointreau giving it a hint of orange. However, if you would prefer to make a non-alcoholic mousse then simply use orange zest in its place. Alternatively, if you are looking for a plain chocolate mousse that has a festive kick, replace the Cointreau with a little Brandy. The pudding benefits from being served with a few thin biscuits – for example: Langues de Chat (see recipe). Break the chocolate into small pieces and place in a heatproof bowl. Melt the chocolate over a pan of simmering water. Whilst the chocolate is melting, whisk together the egg yolks and sugar, until you have a light and fluffy mixture. In another bowl whisk the egg whites to the stiff peak stage. Once the chocolate has just melted, pour it into the egg yolk mix, and whisk until it is fully incorporated. Add the cream and the Cointreau (or orange zest) and stir in. Finally fold in the egg whites a little at a time. Pour the mousse into the bowl or glasses that you wish to serve in. Place in the fridge for 30 minutes to an hour before serving. This entry was posted in christmas, pudding, quick & easy, recipes and tagged chocoholic, chocolate, dessert, food, foodblogger, homecooking, instayum, recipes on December 17, 2012 by Antonia Cooks. Got leftover turkey? Christmas is fast approaching and there is always the question of what to make with the leftover turkey. Pies and curries are always a good option but I have been trying to devise something a little bit different and came up with the idea of using festive flavours in a lasagne and I promise you it works well! The recipe below can be made using cooked or uncooked turkey and you could even substitute the lardons for leftover ham… The lasagne combines the flavours of a good pie with a creamy white sauce and a delicious cheese topping. There is no need to follow the recipe absolutely when making this lasagne. If you have other leftover vegetables that you think would work well in it – for example carrots or sweet potatoes – just throw them in and use any leftover gravy in place of the stock cube and water. If you using uncooked turkey, fry it off in a little oil with the lardons and thyme on a medium heat. Add the leeks and mushrooms (if you are using cooked turkey then add it now) – cook for 2-3 minutes. Crumble over the stock cube and season then, add the water then cover and allow to cook for a further 2-3 minutes. Add the broccoli pieces, remove from the heat and set to one side whilst you make the white sauce. Make a roux by melting the butter in a saucepan. Add the flour and make a thick paste. Slowly add the milk a little at a time, stirring/whisking continuously to avoid lumps. Add the allspice, thyme, leeks and season with pepper. Continue stirring/whisking until the sauce has thickened. Soak the lasagne sheets in warm water for a minute or so. Place in oven and bake at 180C fan for 25-30 minutes. This entry was posted in cheese, christmas, main meal, recipes, sauce and tagged comfortfood, eatclean, healthyeating, lean, pasta, recipes on December 4, 2012 by Antonia Cooks. Gammon is my all-time favourite meat. We normally only have it at Christmas as an accompaniment to the turkey – I have never really understood this as I would be more than happy to eat just the gammon by itself. But then I suppose Christmas wouldn’t be Christmas without a turkey. We normally buy a huge gammon so that we can enjoy it cold in the days following Christmas in sandwiches, pies etc. When it was suggested the other day that we get a gammon out of the freezer I was a little bit excited! I think my favourite bits are the slightly caramelised parts on the outside of the joint and if I am being totally honest the fat (because it becomes so sweet due to the glaze). Unfortunately these are also the favourite bits for everyone else in the family – so you can imagine the contest to get these morsels at Christmas. Whilst cooking the joint may take a while it is absolutely worth it because it just melts in your mouth. 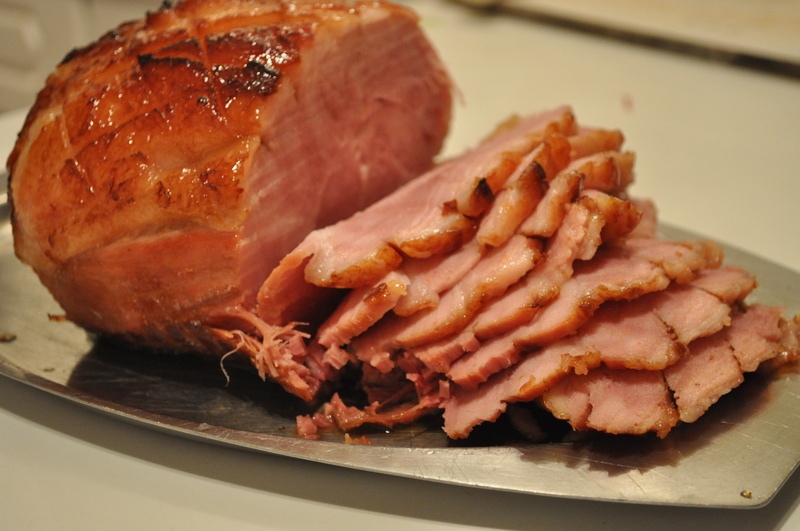 The gammon is good either hot or cold, so if you only have time to cook it the day before, do not worry as it will still taste delicious. 1. Soak you gammon in a bowl of water for a couple of hours before cooking. 2. 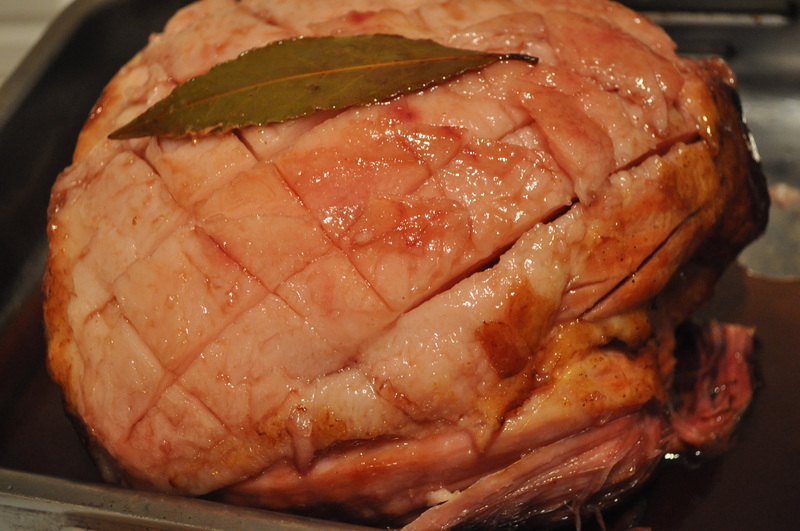 Dry the gammon slightly before placing in a roasting pan with one bay leaf on top and one underneath the joint. 3. Season with some pepper then cover the roasting pan with tin foil. 4. Cook in an oven at 180C fan for 30 minutes per 500g of gammon (e.g. 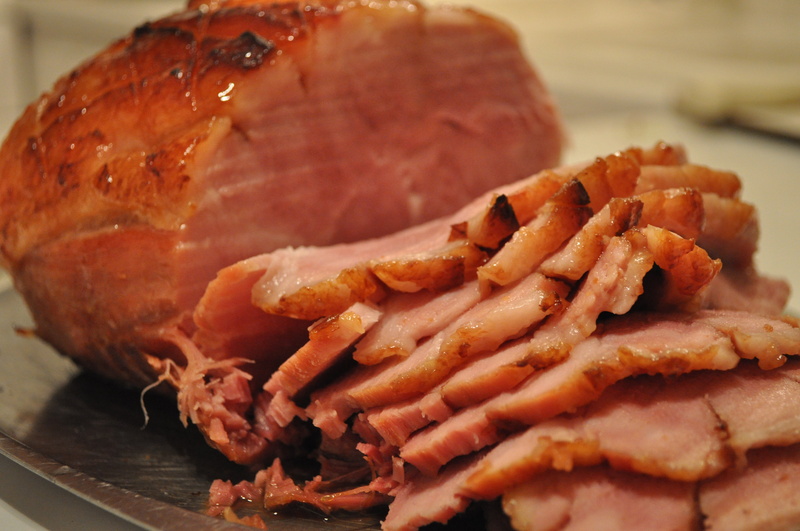 2.5kg Gammon = 2 ½ hours cooking). 5. Remove from the oven and remove any string that the gammon may have been cooking in. Carefully slice off the skin leaving as much fat on the joint as you can. 6. Warm the honey and redcurrant jelly in a saucepan. 7. Score the fat on the joint in a diamond pattern then spoon over the honey and redcurrant mix. 8. 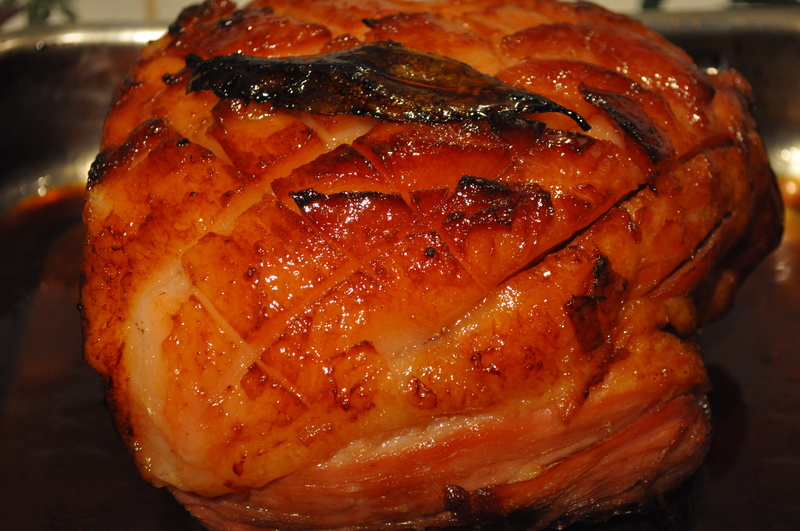 Place the gammon back in the oven for a further 30 minutes, basting the joint every 10 minutes with the glaze. Enjoy! This entry was posted in christmas, main meal, recipes, slow cooking and tagged comfortfood, festivefood, foodblogger, foodie, healthyeating, instayum, roast on November 3, 2012 by Antonia Cooks. 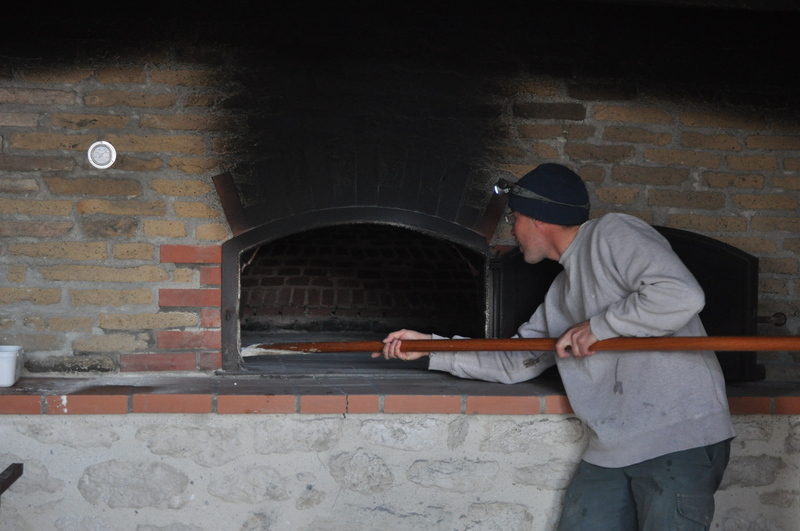 This follows on from a blog that I wrote last week when I mentioned that I had asked our friends who live up on ‘the mountain’ if I could cook in their wood fired oven at the weekend after they had made their own bread. 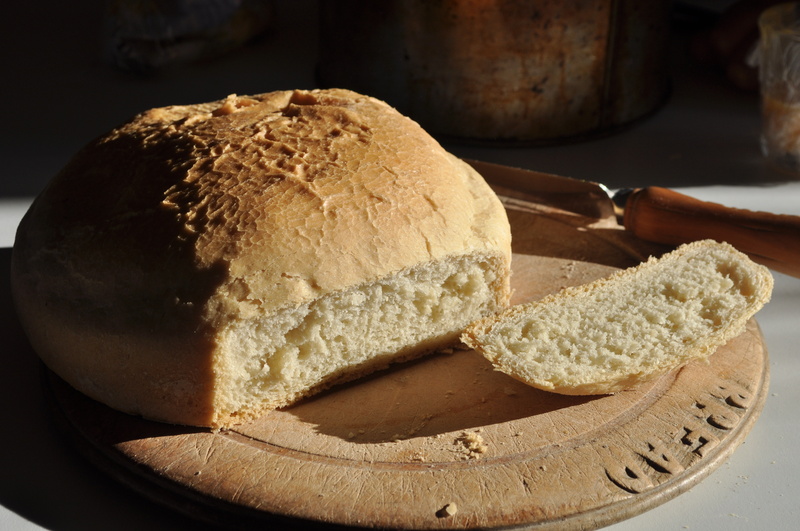 Thankfully, their answer was positive but there was one condition – I had to help them prepare their own loaves on Sunday morning – which meant a 5.00am start. 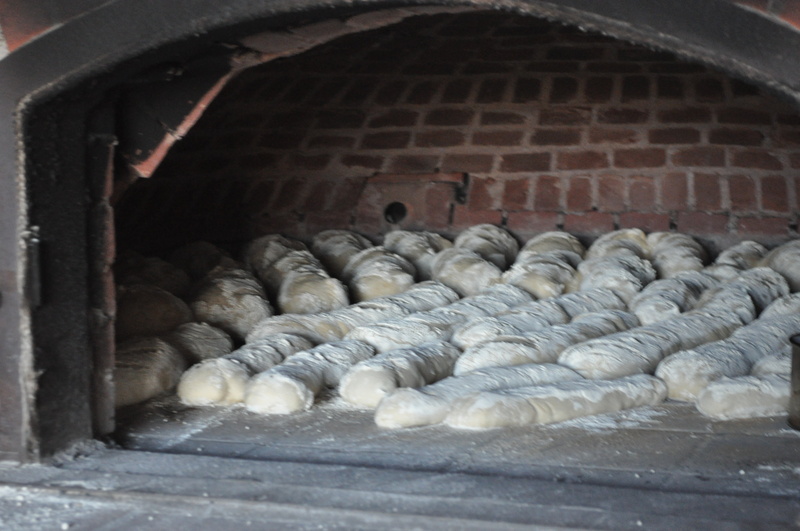 In reality, it actually meant a 3.45am start as I had to make sure my loaves had sufficient time to rise before they went into the bread oven. All I can say it thank goodness the clocks went back on Sunday! I decided to make two loaves, one using my white loaf recipe and the other was my take on a Panettone (a Milanese Xmas cake). It was interesting to see the difference between how my white loaf recipe turns out at home and how it turned out having been cooked in a wood fired oven. The first thing I should say is normally I would have given the bread an extra 30 minutes to rise, but given the cold temperatures of the weekend I don’t think it would have risen much more. 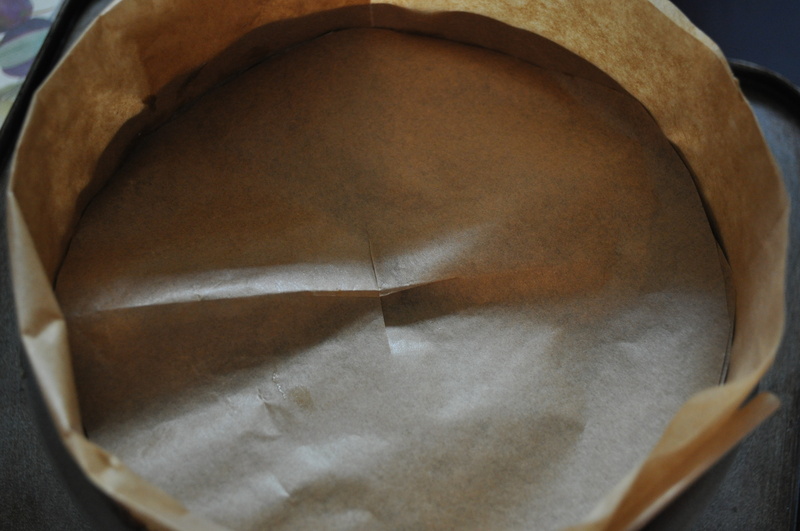 After baking and cooling I was really interested to see what kind of texture it would have. Compared to how it normally turns out, the texture was much denser, the crust was fairly soft, but overall it had a good flavour. 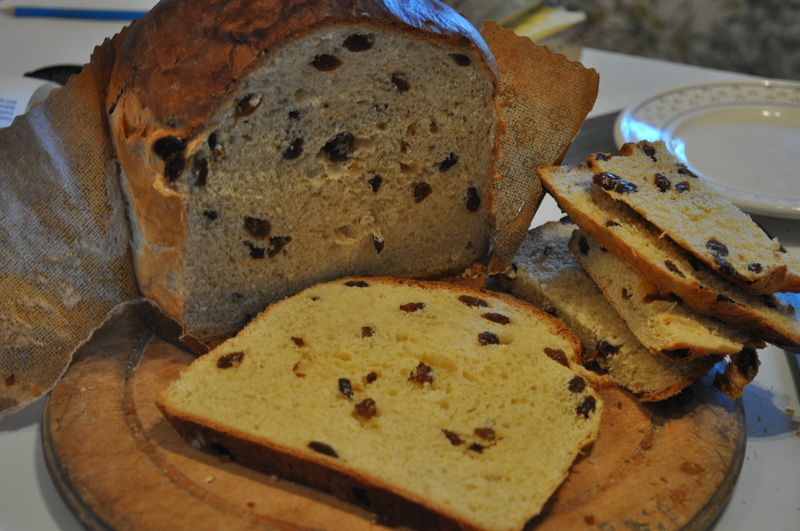 The Panettone is a new recipe that I have been playing around with over the last week. My first attempt produced a loaf that looked great and had the texture that I was looking for, but, the taste had a lot to be desired. So after a bit of tweaking I have come up with a recipe with which I am really happy. 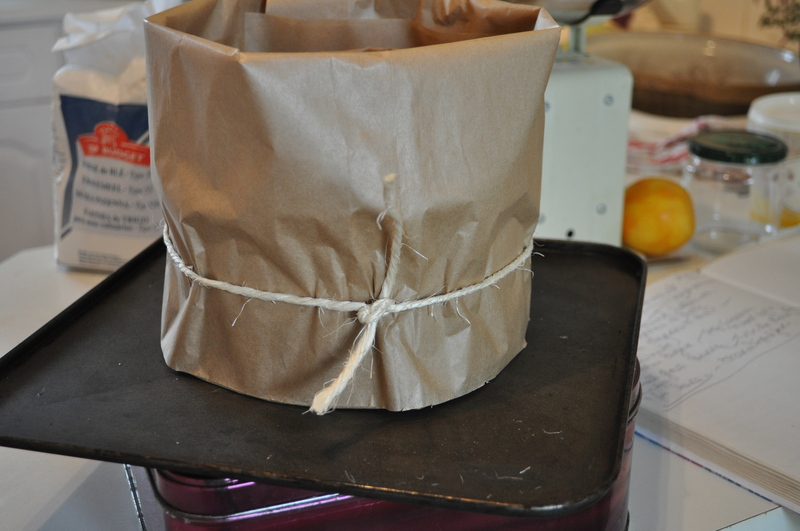 I decided that I wanted to bake my Panettone in an actual Panettone mould. I chatted with a couple of the local bakers and they pointed me in the direction of a professional catering shop (my idea of heaven in a store). It took A LOT of self-restraint to walk away from the shop having only bought 3 Panettone moulds… Whilst this wasn’t strictly necessary (I have baked it previously in a loose bottomed deep cake tin and it turned out fine) it was interesting to see whether it would burn in this type of oven as a paper mould had never been tried before. 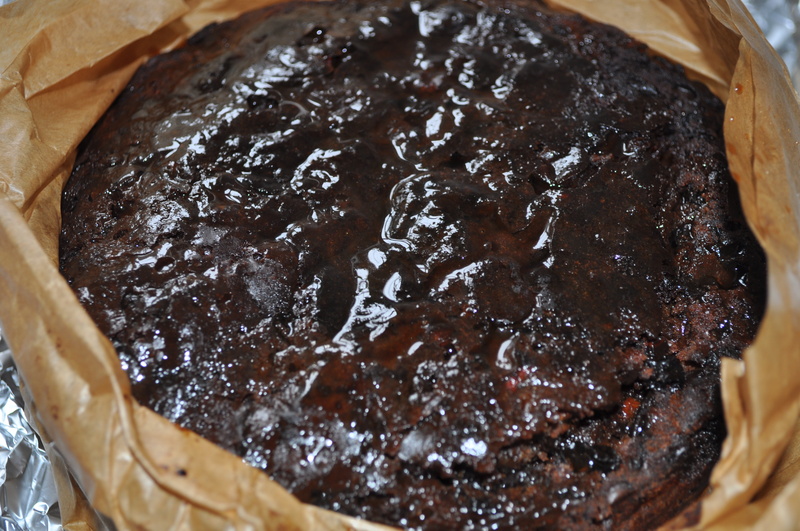 The mould worked brilliantly and withstood the very high temperature of the oven. 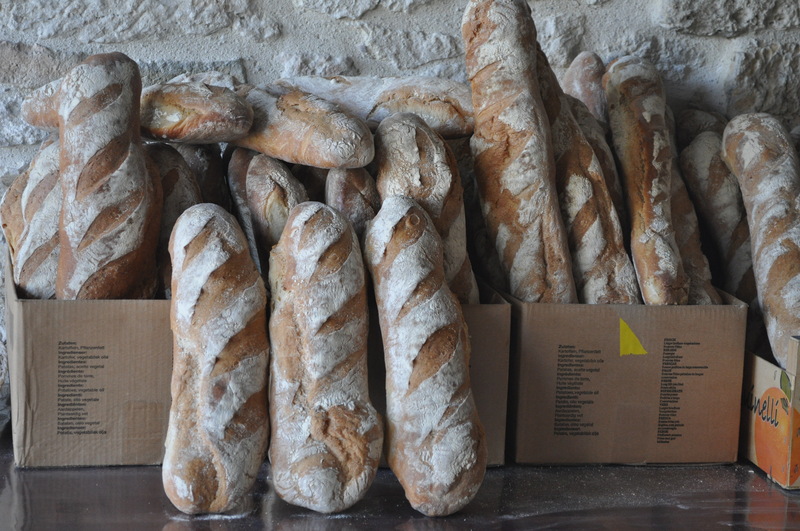 Between drinking copious amount of coffee, I learnt some really valuable skills on Sunday including how to knead and shape a flute and a baguette. 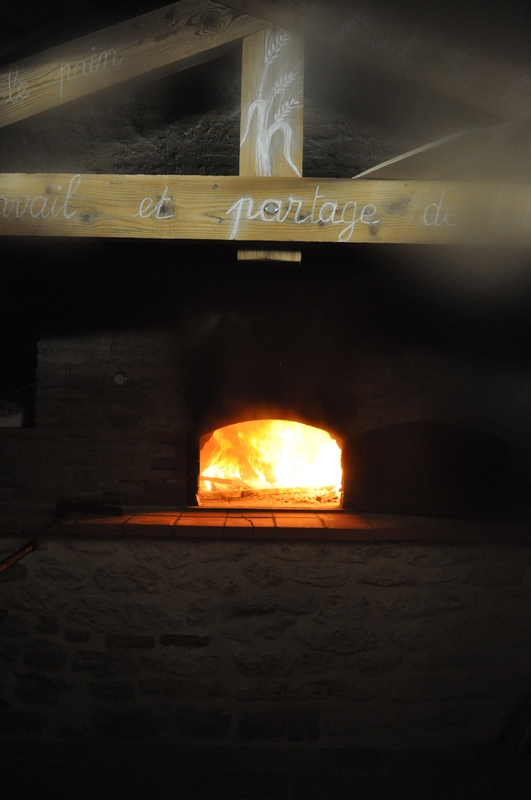 I learnt how to recognise when a bread oven is hot enough (the roof of the oven turns white). 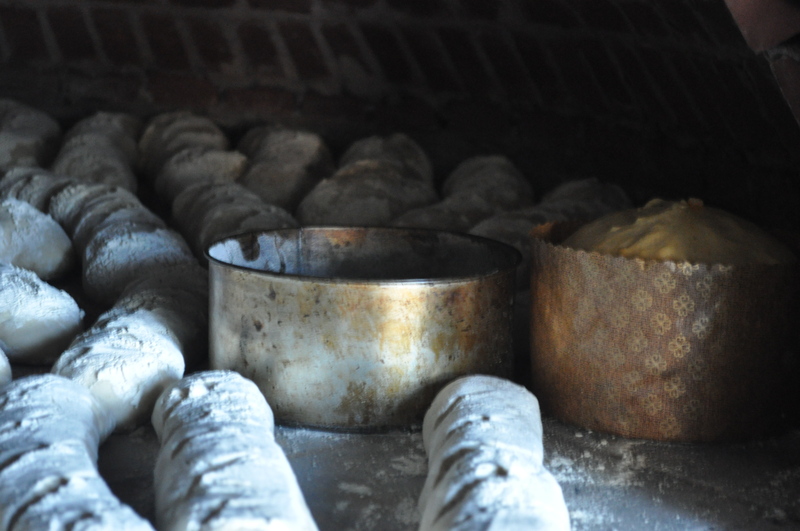 I also came to appreciate how important it is to flour the bread moulds, as a correctly floured mould means the dough easier to get out and equally easier to get into the oven. 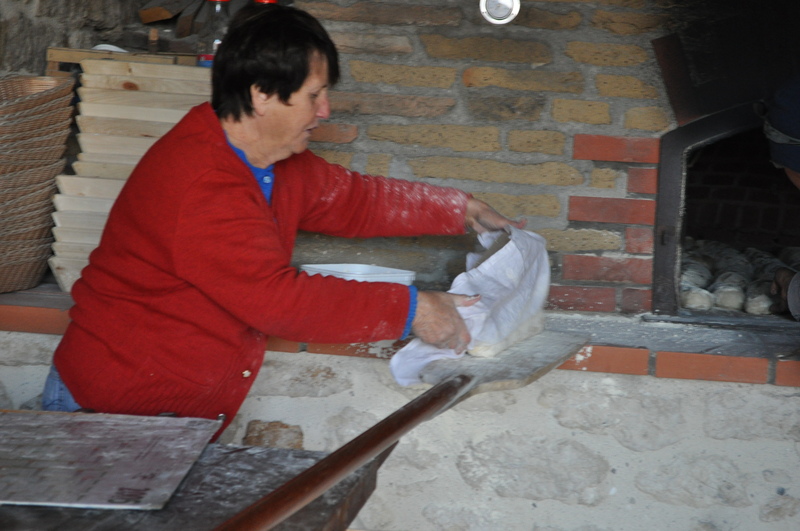 Below are some photos from my morning… (Sadly my hands were so covered with flour I wasn’t able to take any of the kneading and shaping of the dough). 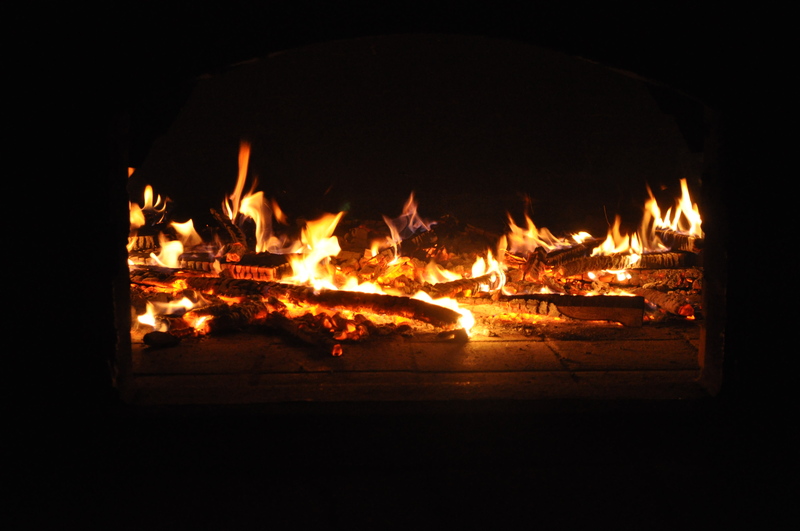 This photo was taken just after more wood was added to the fire to get the temperature right up. 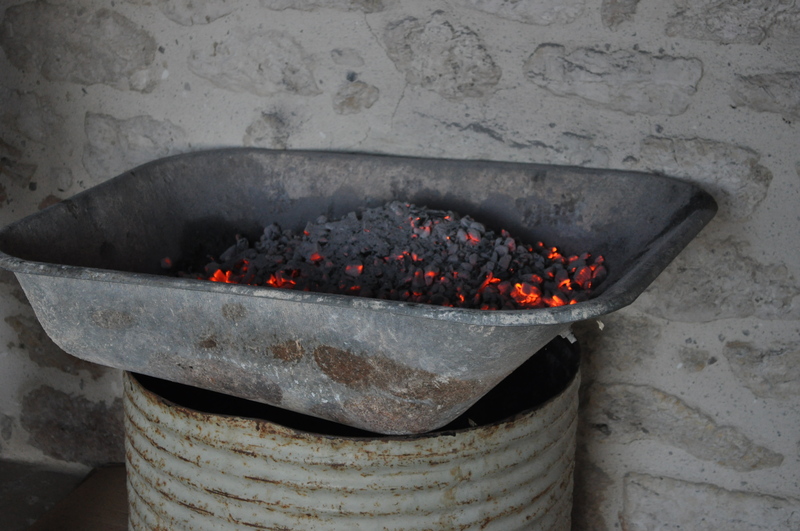 The smoke was billowing out of the front of the fire and the heat that was being given off was impressive. 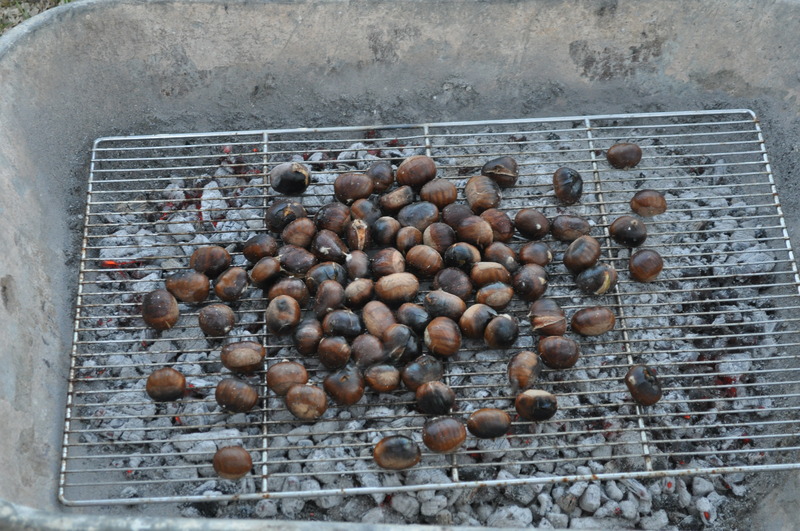 Once the wood had done its work the embers were scraped out of the oven and into a metal container which was then used to cook chestnuts for a breakfast treat. 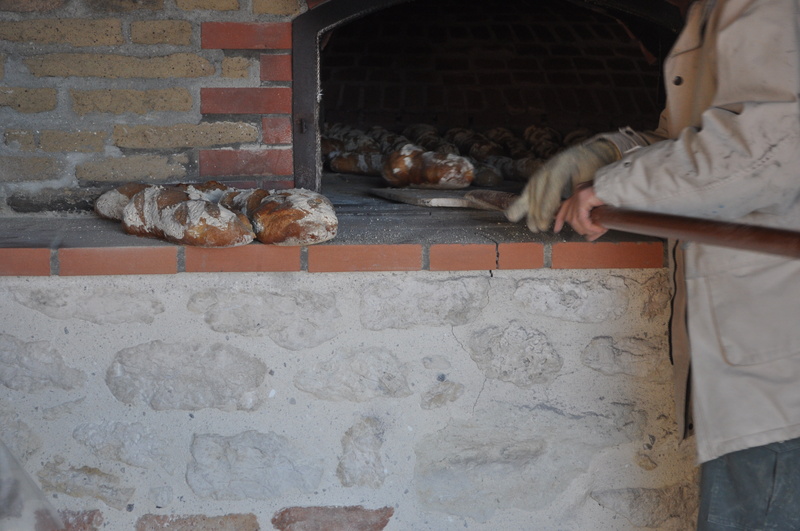 The bread was then placed into the oven for cooking for anywhere between 35-75 minutes. Before being taken out, brushed down, ready to be taken away for breakfast. 1. Place the sultanas, mixed peel and zest of the lemon and orange in bowl, add the Cointreau, stir and then set aside. 2. 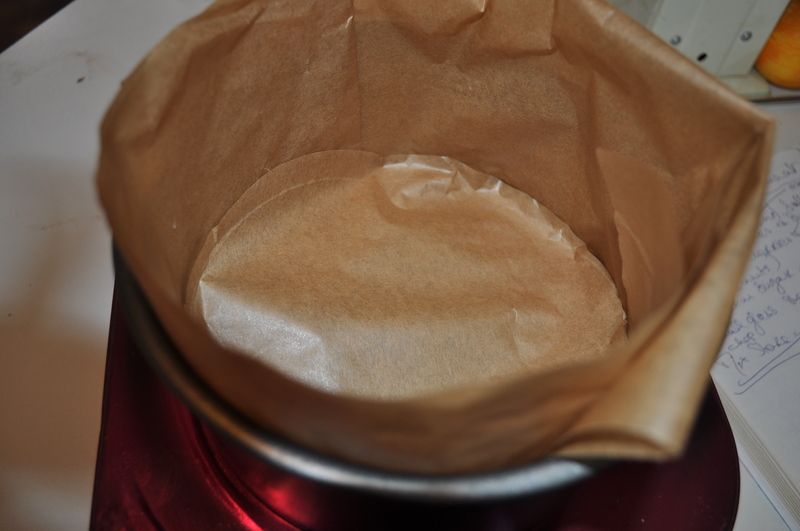 Place the flour, salt, sugar and vanilla in a large bowl and mix together. 3. Place the yeast in a bowl, add the milk, butter and eggs and mix together well. 4. Add the wet mix into the dry mix and combine using your fingers. The dough will be fairly wet. 7. Knock the air out of the dough and add the sultanas, mixed peel and zest of lemon and orange. 8. Knead the dough until the fruit is evenly distributed. 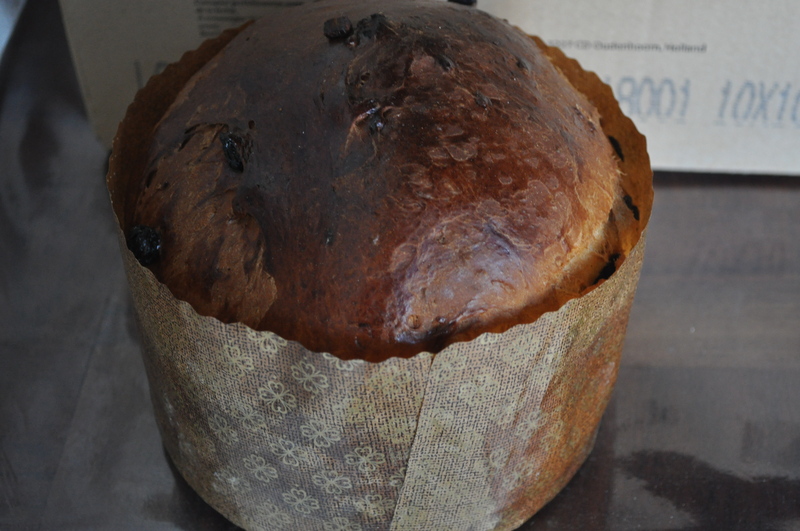 The shape the dough into a ball, place it in the Panettone mould, glaze with a beaten egg and then leave it to rise for the second time (1 ½ – 2 hours). This entry was posted in baking, bread, cake, christmas, recipes, tea time and tagged foodblogger, foodie, foodphotography, homecooking, photography, recipes on October 29, 2012 by Antonia Cooks. Well our kitchen certainly smells like Christmas. 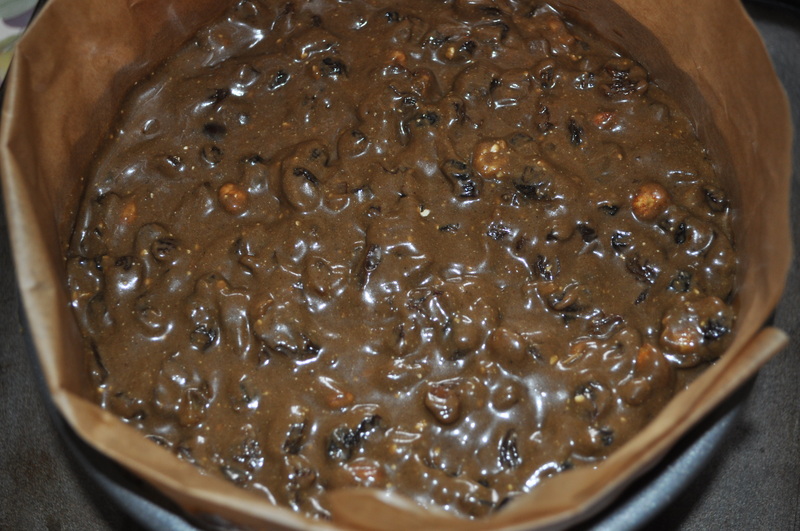 The Christmas cake is going to be baked this afternoon so that it can be fed with an (un)healthy quantity booze over the course of the next couple of months before it is iced and presented on Christmas day. The other thing that I have been making is mincemeat. 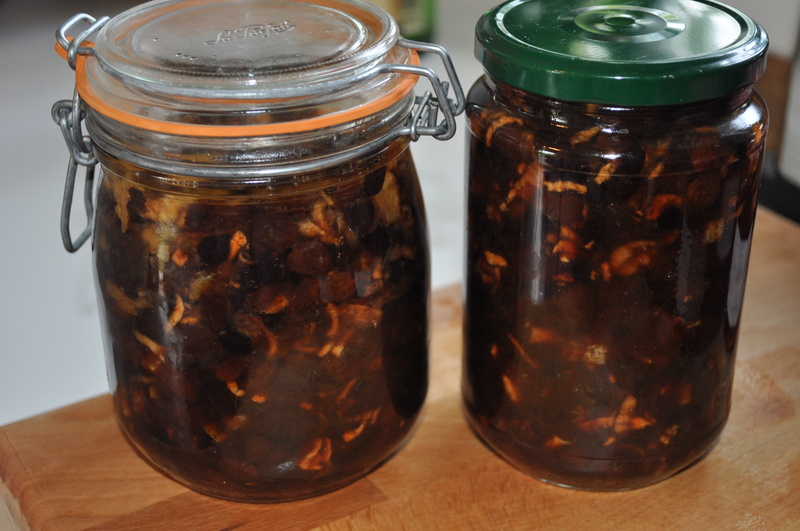 I have never made it before, however when I discovered a jar of absolutely delicious home-made mincemeat that had been maturing gently for several years at the back of my grandmother’s store cupboard I felt I really had better give it a go. This entry was posted in baking, christmas, fruit, preserves, recipes and tagged christmas, food, foodblogger, homecooking, instayum, recipes on October 9, 2012 by Antonia Cooks.